If we were to choose the perfect month to visit this area of Italy, it would definitely be May! The weather is mild, the countryside is in full bloom, and the days are long and sunny. Unfortunately, this is also the month in which there are large tour groups that visit Capri and Positano, making it crowded and hard to get around. In the evening, the crowds leave and you can take long, romantic walks and enjoy dinner in relative peace. Generally, the weather is quite pleasant in May, with temperatures during the day that are not uncomfortably hot and rare rainy days. The sea is still quite cold, but you can take the first swim of the season and the beach clubs are all open for business. It is still cool once the sun sets in May, so be sure to bring a light jacket in the evening and wear long sleeves and closed shoes. Walks and Hikes: May is the best time of year to walk the trails on Capri and the Amalfi Coast, due to the mild temperatures, the long days, and the lush vegetation. If you want to hike the famous Path of the Gods, try to plan your hike on a weekday as the trail can get crowded with groups of tourists during the day, which makes the hike less of a pleasure. Archaeological sites: The weather is also perfect to explore the nearby archaeological sites of Pompeii, Herculaneum, and Tiberius' villas. If you plan on visiting Pompeii, remember to bring a hat, sun block, and water...even this early in the season, the sun can get quite hot during the day! During the month of May, Naples and environs holds the annual Il Maggio dei Monumenti - Monumental May event, during which a number of villas, monasteries, and other historical buildings and monuments generally closed to the public can be visited. Guided excursions and tours are offered, and many are free of charge. The best way to find additional information is to stop by the local tourism office for an updated calendar of events. On the 14th of May, Capri celebrates San Costanzo, the island's patron saint. Be sure to catch the firework show over the water, held each year after sunset. Boat tours: This is the first month in which you can start going out on the water, though the sea is still too cold to swim (except for the truly adventurous!). 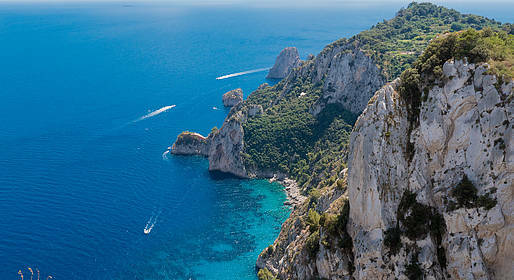 This is the perfect time of year for a boat tour around the island of Capri.